With more online raves than any other recipe on Sunset.com, this homey, comforting casserole summons up the past in the best possible way. 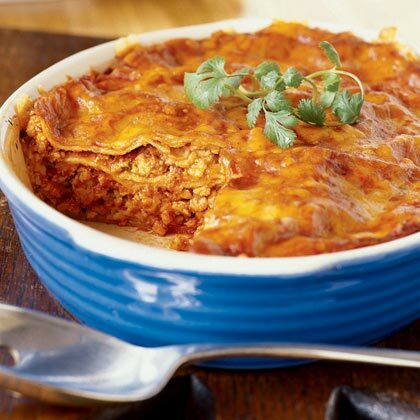 Everything about it is familiar and easy: tortillas layered with ground turkey, enchilada sauce, and seasonings, plus lots of cheese. We love it with ground beef, too. In a 5- to 6-quart pan over high heat, stir turkey, onion, garlic, oregano, and cumin in oil until turkey is crumbly and no longer pink, about 4 minutes. Stir in 1 cup enchilada sauce. Add salt to taste. Meanwhile, cut tortillas in half. Arrange a fourth of the halves evenly over the bottom of a shallow 3-quart casserole, overlapping to fit. Sprinkle a fourth of the cheese evenly over the tortillas, then top with a third of the turkey mixture and a fourth of the remaining enchilada sauce, spreading each level. Repeat to make two more layers of tortillas, cheese, turkey mixture, and sauce; top with another layer of tortillas and sauce, then cheese. Bake in a 425° regular or convection oven until cheese is melted and casserole is hot in the center, 18 to 20 minutes. Sprinkle with chopped cilantro.